Quick: You’ve got a large of land to cover and you don’t want to install 2 or 3 cameras. What do you do with it? The first thought in your head was probably “wide-angle camera“. Certainly, that has been the go-to method for many homeowners or business owners. The wide angle cameras, for example, fisheye cameras (panoramic video cameras) or PTZ CCTV/IP cameras are widely used in large areas like a crossroad, warehouses, parking lots, stadiums, museums, concert halls and etc. A PTZ IP camera stands for pan-tilt-zoom IP security camera, commonly seen as mini-dome PTZ and speed dome PTZ capable of rotating horizontally and vertically as well as zooming in or out to see small details. Its robotic movement – pan or tilt, is powered by security camera’s built-in pan-and-tilt motor, which is controllable via software or apps. Zooming capability is possible because the PTZ surveillance camera is a varifocal lens security camera, which allows you to adjust focal length to change the field of view. There are many benefits of having an outdoor HD pan-tilt-zoom security camera. HD IP PTZ cameras are widely used in large areas, such as front door, backyard, parking lot, detached garage, front porch, fenced front yard, driveway, warehouse, workshop, ferry, pier and etc. PTZ surveillance cameras can rotate horizontally and vertically to cover large areas, for example, Reolink RLC-423 1440p outdoor PTZ IP camera can pan 360 degrees and tilt 90 degrees to cover wider areas in just one camera. 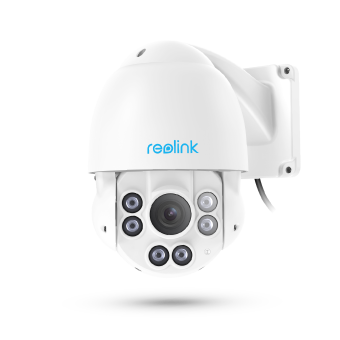 If you install the Reolink RLC-423 under the eave in your front door, you should be able to see your front yard, fence, a stretch of road, street, roadside, driveway, porch, and backyard (possibly). Below is a video shared by a user of the PTZ security camera Reolink RLC-423. PTZ IP surveillance cameras are capable of zooming in and out to see small details via mobile apps, desktop software or web browsers. For example, an HD PTZ IP camera installed on the second floor facing out to the street, can zoom in to see cars strolling down the street, make out faces of people walking by, or identify plate number of vehicles parked outside especially HD outdoor PTZ cameras with capability of plate recognition. Apart from basic directional controls, right, left, up or down, there are some advanced features in some advanced PTZ cameras, such as Preset, Cruise/Tour/Patrol. 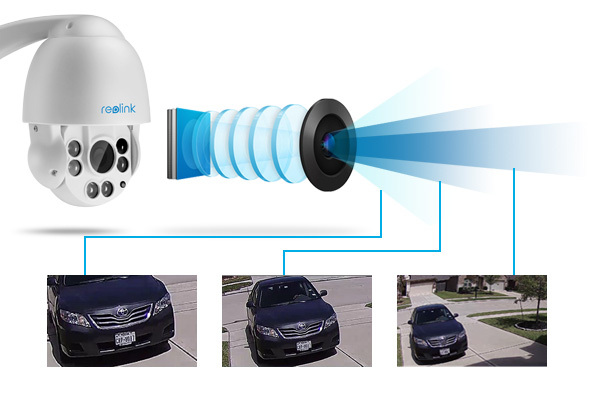 The Preset setting enables the PTZ camera, such as Reolink RLC-423, to switch to a pre-determined spot automatically, which facilitate users to keep an eye on various areas of interest. One of the biggest hook as well as PTZ cameras’ strength is its PTZ Tour/Cruise/Patrol capability; you can define a path for PTZ cameras to patrol these areas automatically and repeatedly at a certain speed. For instance, over a 1 minute period, some PTZ IP camera can keep an eye on the front door, the gate, the parking lot or the fence line once you chart out the course. The pan/tilt flexibility allows for set-it-and-forget-it placement; once the camera is pointed toward the areas you want to monitor, you’ll have a lot of viewing-angle options without ever needing to manually reposition the camera. Users can control the pan/tilt/zoom to cover strategic areas of interest remotely with ease via mobile apps, web interface and desktop software, which allows the camera to be placed in various locations, such as the rooftop, second-floor eave, walls, soffit, or the overhang of the roof. Since one PTZ security camera is sufficient to cover wider areas, thus it would reduce needs to install one more surveillance camera, which in turn reduces the troubles and cost of installation. There are some nice-to-have features and functions users find helpful in PTZ IP cameras. HD Video Resolution – High-resolution PTZ IP cameras like 4MP or 6MP are essential in getting clear and sharp images/videos to recognize faces, identify people or vehicles and catch criminals in the act. IR Night Vision – PTZ IP cameras with IR LEDs and IR filters monitoring property around the clock, especially at night will beef up security, such as in a detached garage or poor-lit backyard. Waterproof – PTZ outdoor cameras rated over IP66 is rendered as outdoor waterproof and able to withstand the element impacts like rainwater. Motion Detection & Notification – PTZ cameras capable of detecting movement and pushing notification in real time when movements occur helps you stay in the loop and prompt you to respond timely by catching an intruder in the act, informing police or calling in for help. Remote Access & Control– users can use mobile apps, software or web browsers to remotely navigate and control pan, tilt and zoom easily with a few clicks. PPZ security cameras are a bit of expensive than fixed lens security cameras as they are inherently packed with more hardware. However, PTZ camera prices vary, for example, best-rated PTZ outdoor IP camera like Reolink PTZ RLC-423 is the best bang for the buck. (see detail hands-on review). Wireless pan/tilt security cameras such as Reolink C1 Pro, however, priced around $99.99, is great value for the money and priced below other bullet cameras. It depends. PTZ security cameras for home are easy to install and setup as other bullet or dome security cameras. Some mini-PTZ IP cameras, such as Reolink C1 Pro, require no serious installation at all and reduce installation even further. Users can just plug in and it works. 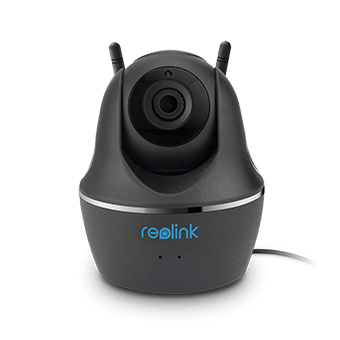 Wire-free pan/tilt security cameras like Reolink Keen eliminate wiring completely. PTZ control can be achieved by either using the on-screen controller of the NVR, or PTZ controller on mobile app/desktop software. If you are running problems, for example, the PTZ control is not working. First and foremost, check the power supply and data connection. Most PTZ cameras run on a different power supply, for example, a mini PTZ uses a 12V power supply while a speed dome uses a 24V power supply. Unstable network connection or spotty network could contribute to the inability to control pan, tilt and zoom remotely. Besides, updating cameras and NVR’s firmware to the latest version on a regular basis boost overall performance. This entry was posted in Home Security FAQs and tagged ptz security cameras. Hi, Sam, yes, the PTZ security camera RLC-423-5MP model supports voice recording and you need to buy a separate mic. There are no special requirements for the mic. Note that we don’t offer power supply for the external mic, so you’ll one that connects to the power source.